The field in today’s Vancouver Fall 5 Miler was lucky; the rain poured down before the race and picked up again afterwards. Conditions during the run were good, no real rain, no real wind, just lots of wet leaves cushioning the path. I had a bit of extra luck today, too. I got a blue ribbon. That’s always fun. The course was flat, two loops through Marine Park and out along the riverfront past zillion-dollar condos with zillion-dollar views of the Columbia R.
I started too fast and drooped the last couple of miles. I’m still learning to pace. “Still learning” means I stink at it. Last night, I reread the chapter called “Mental Training” in the racing book Don gave me. After reading this, I was determined to have a steely enough mind to make up for my lack of speed conditioning and running talent. This really didn’t work. It did succeed in giving me monkey mind for the rest of the night. I tossed and turned, trying to come up with affirmations and anything else that might help with the discomfort of trying to run fast. Finally, I gave up on that and switched to inventing affirmations for falling asleep. For what it’s worth, I have a raw throat from gasping for breath. At one point, I thought I would puke. I told myself, unless I really did puke, I wouldn’t slow down. I think the imagery of that distracted me for a couple of seconds. Probably lost some time there. I finished in an OK time, though. My pace was about the same as my 10k pr from a few months ago. A bug got lodged in my eye. 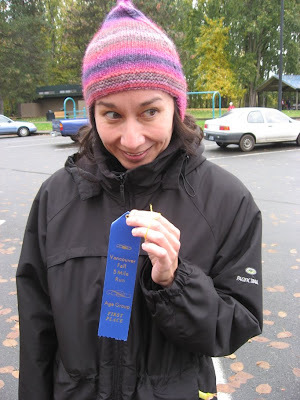 I’m always freezing after I run, so I piled on my sweats, parka, and a hat I knit last fall. I think it's just fine to wear stupid-looking hats. The stupider, the better, really. I feel satisfied that I’m able to combine a running post with a knitting FO post.